Once you archive a chat on WhatsApp messenger, it becomes invisible at all. If you would like to make those chats visible again on WhatsApp Messenger, this guide is going to help you. If you are still having trouble with the situation, please inform us. We are going to response you in a few hours after your questions. You will able to check your messages on the application once more. You can also ask us through commenting this page. You can also check our similar guide about the same issue on here: How Do You View Archived Chats on Whatsapp? You can do the following steps to make archived chats visible on your device. You can scroll down for Android devices since we will start with iPhone. Run WhatsApp Messenger on your iPhone. Go to “Chats” from the bottom menu of the application. You will see “Archived Chats” at the top of chat list. Tap and swipe left to the chat that you want to make visible. You don’t know what is archived chat? 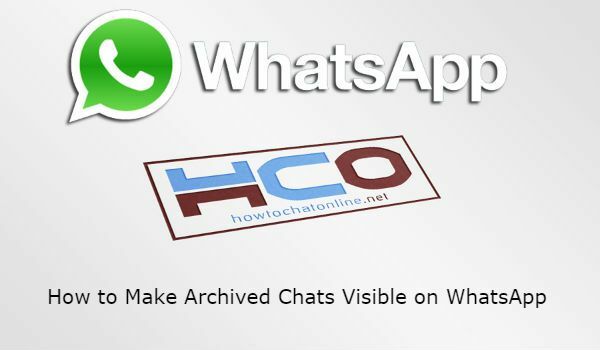 See our guideline: What is Archived Chat on WhatsApp? Launch WhatsApp Messenger on your Android phone. Scroll down at the chat lists until you reach to the bottom. You will see an “Archived Chats” text there. Tap and hold on the chat that you want to make visible. Tap on “Unarchive” icon at the top. These are all you need to do for for making your chats visible again. We have created this content due to a question of one of our followers. If you have any other questions related with WhatsApp, please feel free to ask us anytime you want. You can ask us through commenting the page at below. We are going to respond you as soon as possible. ← How to Delete Whatsapp History Permanently?